Twenty-one players anxiously awaited the start of the game. Only one problem. There were no questions and answers. Darin, who does a superb job each week putting the questions and believable answers together, had left this week’s quiz home. After some frantic searching she came up with an old game she had prepared years ago intended for Flag Day. So tonight we made believe that the calendar said June and answered only questions concerning the American flag. That gave Eric, who was a serious Boy Scout, and Pluto, who was a less serious Sea Cadet, an advantage and they finished one-two. Good Question! : Does the “Stars and Stripes Forever” march by John Philip Sousa have lyrics? I have heard “The Stars and Stripes Forever” too many times to count, and yet never knew there were any lyrics to match the music. “The Stars and Stripes Forever.” is the official march of the United States and it’s John Philip Sousa’s most famous composition (1896). You’ve probably heard it before, even if you don’t know it by name. With the possible exception of “The Star Spangled Banner,” no musical composition has done more to arouse the patriotic spirit of America than this, John Philip Sousa’s most beloved composition. Symbolic of flag-waving in general, it has been used with considerable effectiveness to generate patriotic feeling ever since its introduction in Philadelphia on May 14, 1897, when the staid Public Ledger reported: “It is stirring enough to rouse the American eagle from his crag, and set him to shriek exultantly while he hurls his arrows at the aurora borealis.” Sousa wrote words for the march, evidently for use in The Trooping of the Colors, his pageant of 1898. Not nearly as stirring as the music, probably why you never hear the lyrics. Good Question! 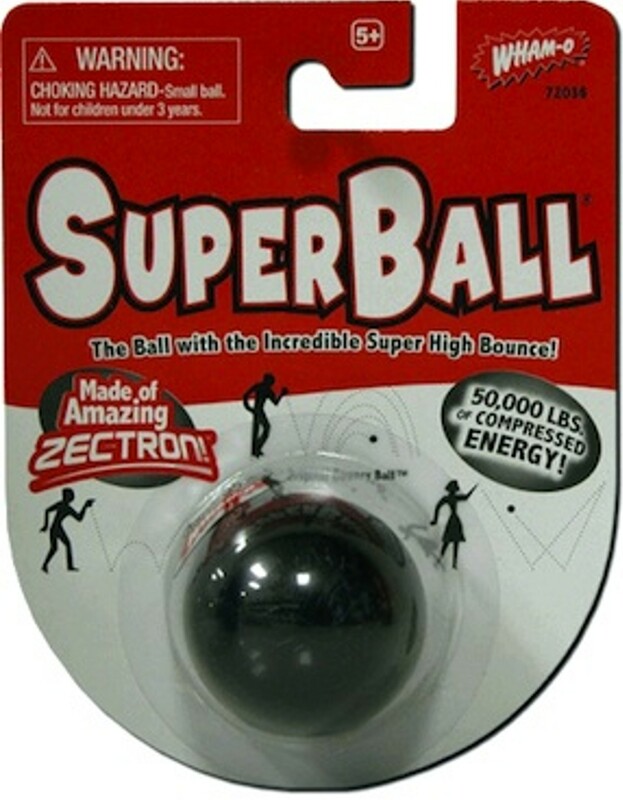 : Which company is famous for introducing such toys as the Super Ball, Water Wiggle, and Hula Hoop to baby boomers? Founded in 1948, Wham-O brought us some of the most iconic toys of all time, including the Hula-Hoop and Frisbee in 1958, and the Slip-n-Slide in 1961. The hula hoop gained international popularity in the late 1950s, when a plastic version was successfully marketed by California’s Wham-O toy company. In 1957, Richard Knerr and Arthur “Spud” Melin, starting with the idea of Australian bamboo “exercise hoops”, manufactured 1.06-metre (42 in) hoops with Marlex plastic. With giveaways and national marketing and retailing, a fad was started in July 1958; twenty-five million plastic hoops were sold in less than four months, and in two years, sales reached more than 100 million units. Veteran hula-hoopers have long stood by its aerobic virtues. “A lot of people are interested in hooping for its health benefits, which might get them hooked, but it’s also such a fun way to do cardio,” said Bex Burton, a hula hoop instructor who founded Sense of Motion, a Brooklyn-based company that teaches hula-hooping, Pilates and yoga. If you try a weighted hula hoop, use a hula hoop that’s the right size for you. The hoop should reach somewhere between your waist and midchest when it’s resting vertically on the ground. The weight of the hoop is up to you. The smaller and lighter the hoop, the more energy it takes to keep the hoop going. But the bigger and heavier the hoop, the easier it is to keep going, which means you may be able to do it for a longer period of time. You can experiment with different hoops to see which kind and size you prefer. Norman Stingley, a chemist, did experiments in the 60s with a synthetic called Zectron. He compressed the material to 3,500 pounds of pressure per square inch. He ended up with a power ball that could bounce over buildings. Only Norman’s employer, the Bettis Rubber Company, didn’t want any part of his new toy. Big mistake. Wham-O took it on and sold 7 million Super Balls in 1965. In January 1967 the first Championship Game between the NFL and AFL took place and needed a name. As K.C. Chiefs owner Lamar Hunt watched his kids play with the new ball, Super Ball became Super Bowl. Water Wiggle – Watch Out! Water Wiggle… best toy in the world… until it hit you in the FACE! In1 962 Wham-O unleashed the innocuous-sounding Water Wiggle on an unsuspecting populace. If you happened to have particularly powerful water pressure in your neighborhood, the Water Wiggle turned into a Tasmanian Devil of sorts, lashing out in all directions, bobbing and weaving like a prize-fighter. Your young reflexes were no match for the Water Wiggle, which could strike without warning and deliver a blow to the face, and other bodily areas as well. And that plastic head was heavy — but bloody noses and chipped teeth were a small price to pay for some cool fun in the summer time. Judge Judy and Tall Paul, returned from their Florida furlough having spent the entire time buried in their Funk and Wagnalls, were now ready to take on all comers. The rest of us had spent our time digging out of snowdrifts. We didn’t stand a chance. Good Question! : How many lines should a limerick have? Limerick poetry has never been given a deserving place among the cultivated forms of poetry. The subject matter of major Limerick poetry is of humorous nature and the length of limerick poems is short and sweet (just five lines!!) that is why it is loved to be read by people all around the world. Who loved an occasional dally. who bragged of his prowess, but lied.